Looking for a dedicated Wikipedia reader? Look no further than the WikiReader. This little guy stores all of Wikipedia on a micro-SD card for immediate access when you need to prove a point. Read on for more info. Meet WikiReader. In a world with constant interruptions comes a device specifically designed to facilitate your focus. With 3 simple buttons and 3 million topics, WikiReader brings the iconic Wikipedia to all generations. Touch Screen for Simple Navigation. The high-quality touchscreen puts everything from typing to scrolling under the control of your fingertips. With over 3 million topics, WikiReader has answers for nearly every question. Be prepared when curiosity strikes. 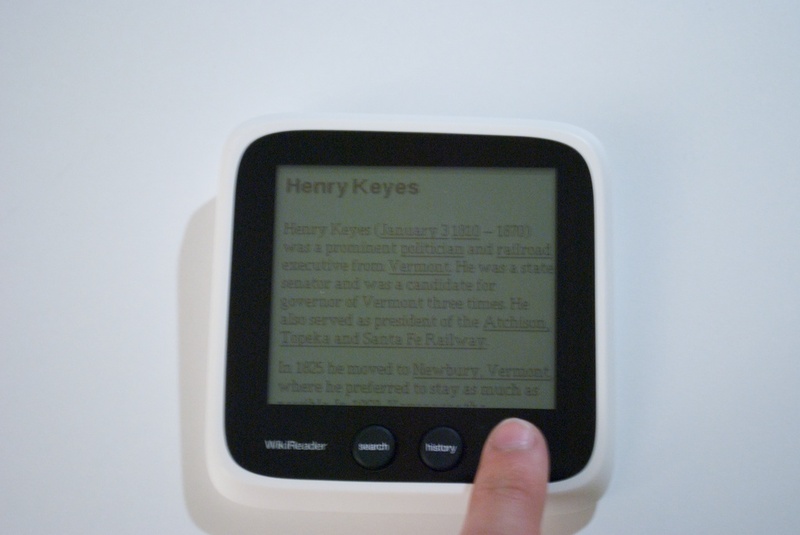 With your active life in mind, WikiReader’s screen is fantastic under bright sunlight as well as indoors. Hold WikiReader in your hand and you’ll instantly feel why people love its organic design. Forget daily charging, two standard AAA batteries (included) will power WikiReader for about 12 months of normal usage. Or put in those unused rechargeable batteries lying around in the house. Those will work, too. We kept it simple – now have fun. Search, view your browsing history, or go random and let WikiReader surprise you. From the scratch resistant tempered glass screen to the high-quality plastic case, WikiReader was designed and engineered for added durability. 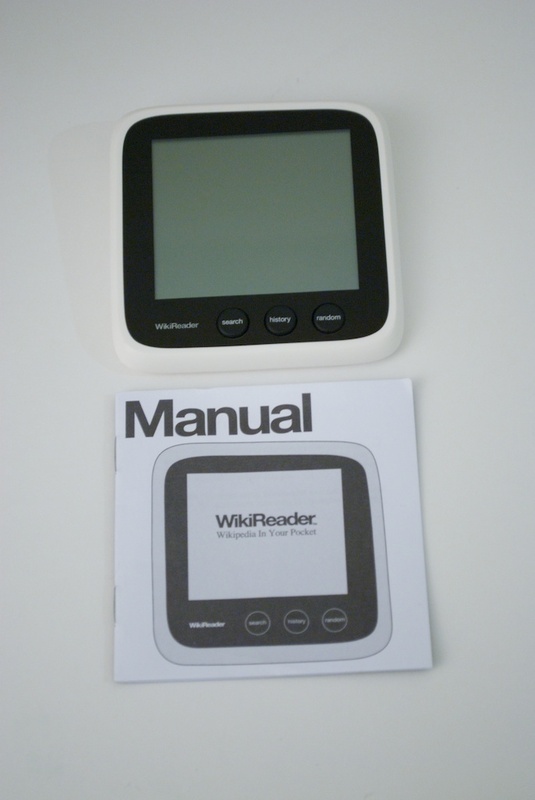 The WikiReader is a very simple device. You simply download Wikipedia from WikiReader’s website and copy it over to the micro-SD card located behind the battery. The WikiReader does come with Wikipedia installed on it already so it’s good to go out of the box! 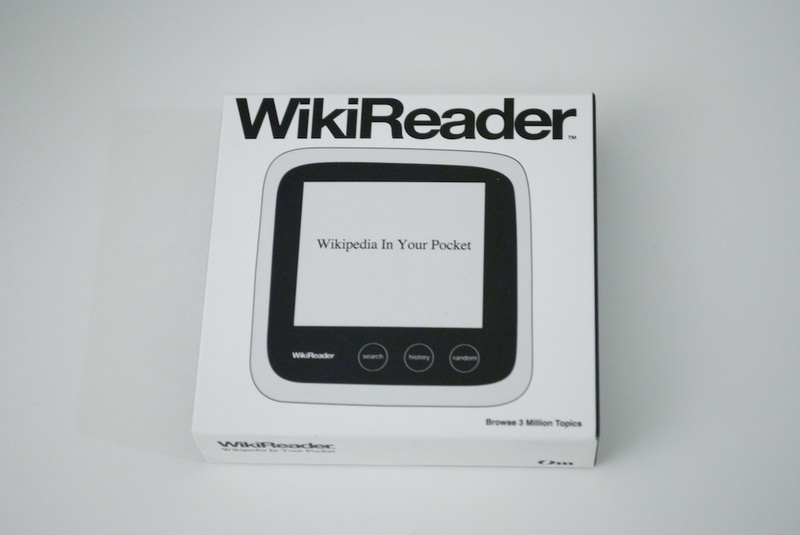 The WikiReader is somewhat small and can easily fit into your bag, or men’s pants pockets (I don’t know how you ladies get around with such tiny pockets), though it’s square shape is a little awkward in regular fit jeans like my Levi’s 514s. The screen is made of class and is easily cleaned. The tree buttons along the bottom are responsive and of good quality. The on button is a little sensitive though, so it can easily be turn on in your pocket. The white plastic body is designed in a subtly irregular shape which could prove obnoxious to to those with OCD. This device works just as advertised. Turn it on, press search and type up what you are looking for on it’s touch screen. Want to find something that you looked for yesterday? Press the dedicated history button and scroll through the list. Bored? Press random, and behold the many articles on Wikipedia. It’s always great to see products that work as advertised, but there are a few caveats. For one, the screen is not E-paper the way it looks. It’s just a monochrome LCD screen like calculators and the old Game Boy. It’s also not back-lit, so don’t expect to use this in dim light. While you may have seen these coming, there is one issue that I can’t let slide. The screen is unreadable when scrolling due to a poor refresh rate, making scanning articles very difficult. However, the touch screen works very well, and searching is almost instant. Yes, that is it scrolling! Overall, the WikiReader is a nice device, it does as advertised and is very quick. This could easily be a great present for you kid, or for someone that doesn’t want to pay for a data plan. 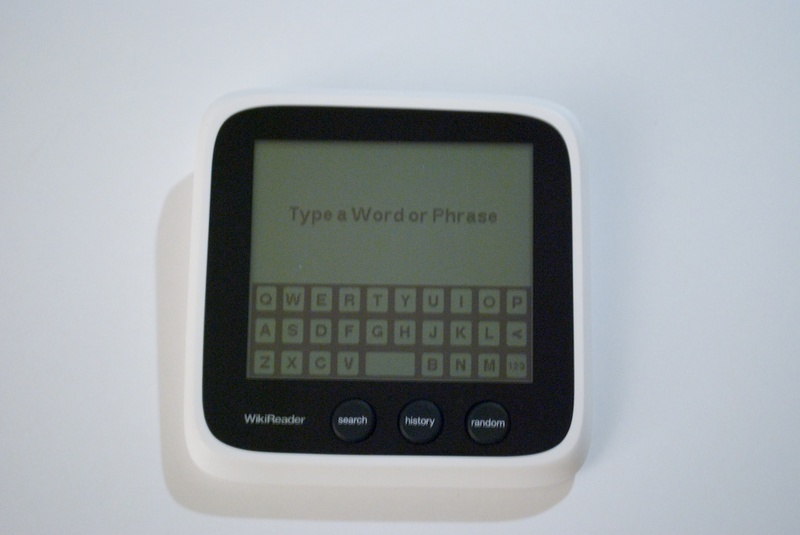 If you are interested in the WikiReader you can pick it up at the their website for a staggering $99.